And the 1st place goes to Primaeval! Big thanks to all voters! The 3rd update is here and it’s all about Magic! I’ve spent too much time trying to find a convenient way to integrate the magic combat system with the melee one, my goal was to give the player the ability to use both of magic spells and melee weapons and seamlessly switch between them. 1) Reduce the entering process time by speeding up the ritual animation, didn’t help that much as the player still exposed to enemies. 2) protect the player with some kind of magic shield during the entering process. now the player is no longer exposed to enemies but entering process is still slowing down the combat pace. 3) Do some extra animation work and blend the ritual animation with navigation ones to allow the player to move freely during the entering process. by combining all of these ideas I got pretty satisfying result. A magic spell may be represented by one or more symbols written on magic scrolls (more details in future updates).player has to remember the correct symbol that represents the spell he wishes to cast and draw it quickly to activate that magic spell. Magic spell caching enables quick spell switching so player can strategically plan thier spells combos and attacks. Smooth transition between Magic and Melee combat states keeps the flow of the over all combat engagement. That was all for this update, hope you like it and stay tuned for more. 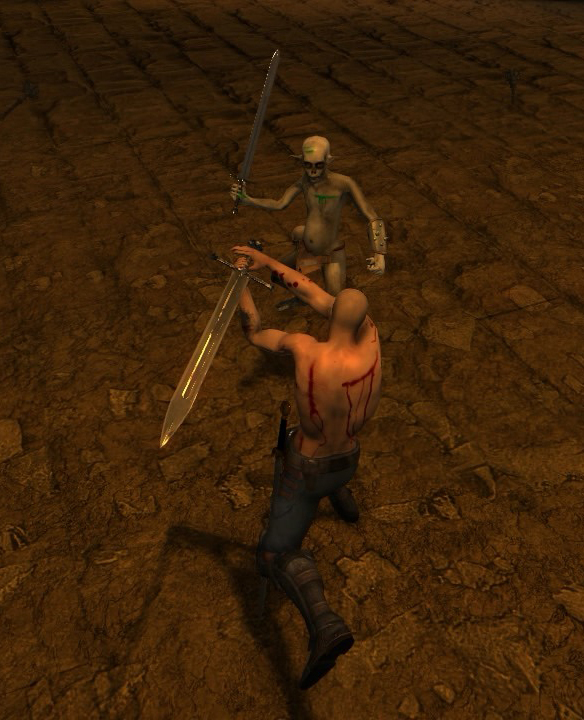 The game adopts a tactical real time physics based melee combat system with wide range of attacks and moves, where the player has the full control of his character, both successful and failure attacks have their respective consequences. in addition, the game features several types of weapons each with it’s own play style. With 3 types of attacks ( normal, heavy and ultra) player can perform several attack combos as some attacks can be chained together depending on the player’s hand position at the end of the first attack and the start of the second one. The melee combat system was designed to give the player a fairly rewording and fun experience, the bloody flying limbs of your enemies will guarantee you having great moments of excitements. The magic system in Primaeval is a symbol based system and heavily relies on the player’s memory , a magic spell may be represented by one or more symbols written on magic scrolls. 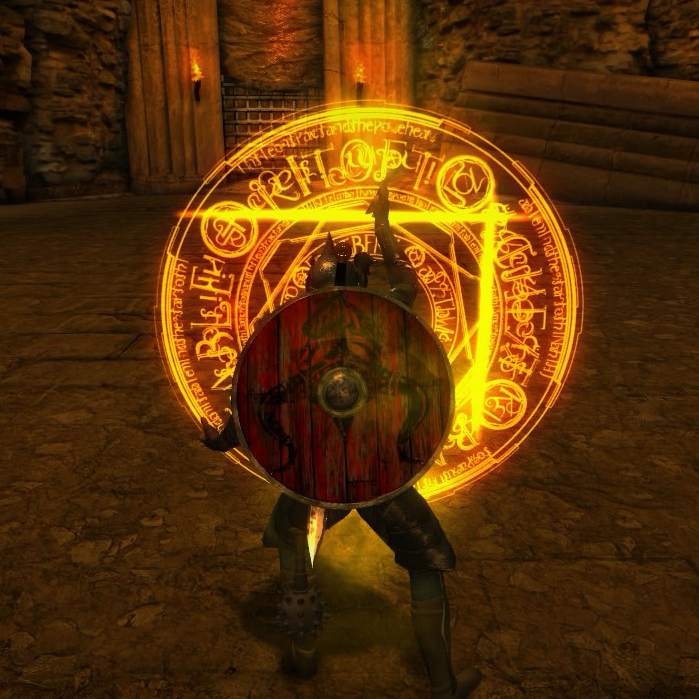 during combat, the player has to remember the correct symbol that represents the spell he wishes to cast and draw it quickly to activate the spell, otherwise the player will need to reopen the scroll and waist a precious time. drawing symbols mechanism is still under active development! AIs in Primaeval were designed to be challenging and merciless, a horde of enemies wont’ tackle the player one by one but instead they’ll attack together whenever it’s possible and it’s the player’s job to tactically choose the best gameplay style to deal with this situation depending on his current equipments and weapons. Primaeval has set of logical and mechanical puzzles designed to tease the player’s brain and sometimes frustrate him!